John Pugh was appointed Chancellor of the University of Alaska Southeast on August 2, 1999 by then University of Alaska President Mark Hamilton. Chancellor Pugh is a former Dean of the School of Education, Liberal Arts and Sciences at UAS, and had been Dean of Faculty for three years at the time of his appointment as Chancellor. Additionally, he taught courses in the areas of sociology, psychology, criminology, corrections, and counseling for both the Anchorage Community College and here at the University of Alaska Southeast. Pugh’s educational background is in philosophy and social work. He holds a Master’s Degree in Social Work from the University of Texas at Austin. He graduated from Baylor University with a Bachelor’s Degree in Philosophy. John Pugh came to the university in 1987 after a 15-year career with the State of Alaska, Department of Health and Social Services, serving as Commissioner of that department from 1983 to 1986. 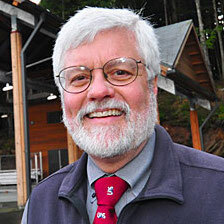 Chancellor Pugh is a former chair of the Northwest Regional Educational Laboratory, and for eleven years was a trustee of the Alaska Mental Health Trust Authority. From 2009 until his retirement in May of 2015, Chancellor Pugh served on the Board of Commissioners of the Northwest Commission on Colleges and Universities (NWCCU), the regional accrediting organization for 163 institutions in the U.S. Northwest. He was also the State of Alaska Representative on the board of AASCU (American Association of Colleges and Universities) from 2006-2015. In 2011, he was appointed to the Alaska Airlines Southeast Community Advisory Board. John Pugh strongly believes in service to his community. He has served as president of the Gastineau Rotary Club. He also served as vice-chair of the Board of Directors of the Juneau Economic Development Council. Chancellor Pugh is married to Margaret Pugh. Their children and granddaughters are all lifelong Alaskans. Chancellor Pugh was awarded Emeritus Status by the UA Board of Regents at the 2015 UAS Commencement Ceremony in Juneau.